Life here is as hectic and busy as ever. We don’t seem to stop in between hospital visits, getting Sam up and about and getting the care organised. Despite a few colds, which knock him sideways and are always a worry, he’s very happy and as active as ever. It takes a lot out of us keeping going like this and there is nothing ‘normal’ about any day, but seeing him happy or seeing him move his arms fills us with energy and keeps us going for the next day. The arm supports you bought are just amazing and have defintely improved his range of movement. He now moves just a few cm’s rather than mm’s but enough to knock blocks off a stool and make a loud bang and maybe one day to operate a switch – which is our aim. Sam gets such joy seeing his arm move. I wish you could see the look of wonder he has. We alternate using the arm supports and the FES bike. Standing with his arm supports makes him look like the robotic gun fighters from Matrix 3! He looks so pleased with himself! We have just got an electric powered chair on loan which Sam operates with his chin/lip control. This is the next life changing thing for Sam. He hasn’t quite got it yet but it’s a cute little buggy type thing and he actually makes himself move. It’s just fantastic seeing his face and I’m sure he won’t take long to realise the control he can have. For him to move where he wants, or face where he wants will change his life. I can’t wait until he’s zooming off! So I’ve been bashing things down to make space for him to move. It’s like having a quad bike in the house! With your help, the next thing that would make a difference to Sam is an outdoor 4×4 pushchair/buggy/electric chair that we could take off-road, on beaches etc. We would like an electric chair for Sam but there could be issues with chin control/bumpy ground and broken teeth! We’re just looking at what’s available, but would love to get Sam off road again. We’ll do more research and let you know what is next on our wish list, made possible by the constant kindness of you all. Here I am in Jerusalem. It was December and I was very surprised that it snowed. I had a lovely time there although it was very cold!! Thanks to the ongoing book sale, sterling efforts in Peterborough (who to date have raised a rather amazing £1384), some very generous donations and a team birthday we have reached the magic £17k mark! Not bad for a wet January! Help us reach the next milestone and do something for Sam. You could start your own book box, arrange an unwanted presents sale, do the marathon or a physical challenge, sit in a bath of beans (or whatever makes you happy), or make a donation. Every little helps (as they say)! Let’s see if we can reach £18,000 by the end of February and maybe hit the big £20k by Sam’s third birthday in mid-March? 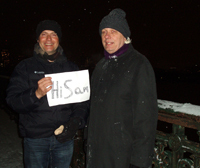 Hi Sam from Boston, Massachusetts! Here we are by the Charles River in Boston, USA on a snowy cold night. In fact it was so cold that the river froze over night and made swirly patterns where snow had settled and drifted on it. We are all attending a WAI (Web Accessibility Initiative) meeting at MIT (Massachusetts Institute of Technology); something that your Dad will know all about. Andrew works at Vision Australia and Wayne works at California State University. At the meeting we were talking about how we can make websites accessible to everybody, including people who have sight, cognitive, hearing and mobility problems. This is something I am sure you will get excited about too in the future! The unwanted Christmas presents sale in Peterborough on 16 January made £254. Specifically that was £214 from the sale of donated items and £50.00 from a raffle. Many thanks to all who contributed items and gave new home to things! Hello Sam from Emily, Carmen and Arlo in Kendal (left to right)! Our mummies tried to get us to pose with a Hi Sam banner, but we were in a wiggly mood! PS Emily and Arlo have now both done sponsored walks for Sam, raising £122.75 between them. Thanks to everyone who sponsored them.